18V ONE+™ LITHIUM+™ MOWER is rated 4.7 out of 5 by 107. Rated 4 out of 5 by GSDP from Nice Cut, Powerful, Good Battery Performance Out of the box with a fresh battery charge, I mowed 800 sq feet on 25% of the battery charge on grass that was 4 inches tall, using setting 3 on the mower. The unit responded well, although a bit rigid to turn. The mulching part didn't snap in all the way and needed a good push to lock in. Overall performance was very good. A bit disappointed that the fold-up isn't as quick or tidy as some other models and that it doesn't stand-upright. I'm concerned that the handle locking clips may not last with the folding and unfolding. The carry arm at the top is very handy! Overall, looks like a good mower and hope it stands the test of time. Rated 5 out of 5 by CobraJ96 from Love this mower We have a good sized corner lot that I can mower about half of on one set of 4ah batteries. It use this mower in the morning close to my neighbors so I don't wake them at 8:00am. I also trim around the several trees and beds we have. I can then finish the yard with my 8+ year old gas mower. The Ryobi is very light so it is easy to push and then around our trees, sidewalks, and flower beds. I may check to see if the new 6ah batteries will fit to now more with it. I just wish more Ryobi parts were stocked at Home Depot. HE only had the blade for this mower. 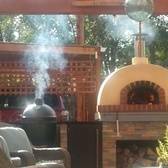 I do my own service work and try to keep my equipment well maintained so they will last. Rated 4 out of 5 by Rndom from First time First time I used it, it was great. Finished my backyard on the set of batteries it came with. About what I expected. I’m satisfied with it, I have a decent size front and back yard. I bought a second set of batteries, so I don’t have to worry about waiting to cut each yard. I’ve read many horrible reviews about this mower, I’ve seen none of the complaints though. Batteries maybe, but I Again expected that. Lasted about 35-40 mins on one set. So unless you’ve never owned anything battery operated, you’ll complain no matter what. It’s meant for your regular surbabanite yard, nothing bigger. I have no complaints so far. Rated 4 out of 5 by Lpswim from Great for the power! I live on a quarter acre lot with a small yard. I didn’t want to mess with gasoline yard tools Due to the small size. This mower is great at cutting and bagging. Only lost a star because some of the parts that I think should be higher quality are made from plastic. And you have to keep an eye on the level of grass in the bag because it will bog down the motor if it gets to full or wet. This mower gets the job done great! And I have a lot of people stop and ask how the electric mower and yard tools are. I tell them you can’t beat it! Rated 3 out of 5 by GT11 from Very Good for Certain Tasks This mower does a very nice job on small dry lawns with moderate growth. However, it bogs down considerably if there is any dampness, even at moderate length. At that point the mower will just shut down It wouldn't be so bad if you could just start it up again but it seems the battery must sit for 5-10 minutes before it will engage again so you better have some spares. You may also need to mow more often as you don't want to tax this mower at longer lengths. 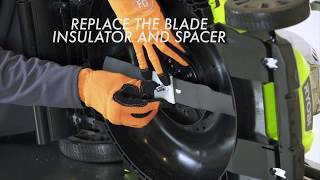 The 16" blade length will also require extra passes to complete the job. None of this should be surprising for a 18V small mower, just be aware of the limitations. I would recommend for small yards that can be mowed predominantly in dry weather. I fall into that category but if I had to do it over I think I would go for the 40V model. Rated 5 out of 5 by aaronm from exceeded expectations Bought the 18v b/c uses same batteries as other ryobi products, was skeptical if the 18v would be enough to cut the grass. To my surprise it totally out performed my expectations. With one regular and one high capacity battery i was able to mow 3 town house front yards (lil strips) and my back yard which is about 20x20 and still have plenty of battery left. Mowed without bag and mulched without a hiccup, only thing i noticed was a small patch of wetter dense grass and heard the mower strain just a little bit but for 18v its definitely all i need. Rated 4 out of 5 by DNdP from It gets the job done I bought one of these a couple of years ago while in Northwestern New Mexico. My yard was a postage stamp and I never recharged it all summer. Then we moved back to Southern Illinois with a huge lot. We could not initially afford a rider so with a great deal of summer sweat we mowed the whole thing with this mower. It did great. I did not fair as well. Maneuverable, clean cutting, mulched part of the time and blew the grass clear part of the time, and the Ryobi never missed a beat. The only weak point Ii can see is the cheap plastic wheels they use for it. I don't know how long they will last. Rated 4 out of 5 by Authentic4L from Awesome little thing On the two times I have used this product I have been impressed by how easy it is to just pop in two batteries and get started. The only downside is that I feel like the run time is a bit small. I had done one side of my backyard and had to change out the batteries for another pair of 4 Ah batteries. After finishing the backyard I checked the previous batteries and one still had 2 or 3 bars of battery so I was confused. Besides that little ordeal, cleaning the lawnmower was a breeze with my ryobi leaf blower which made it look like new. Take back your lawn with the RYOBI 18V ONE+ Lawn Mower! Equipped with a push-button start, this mower offers convenience that gas mowers just can't. With it's 16" deck, this mower is perfect for maintaining small yards and will fold up for compact storage when finished. The 5-position single point height adjustment easily adjusts the cut from 1.25 in.-2.75 in. and the 2-in-1 system allows for mulching or bagging based on preference. Best of all, this mower comes with 2 18v Lithium+ 4.0AH batteries for increased power and extended runtime. These batteries fit all RYOBI 18V tools and will power your mower for up to 40 minutes. 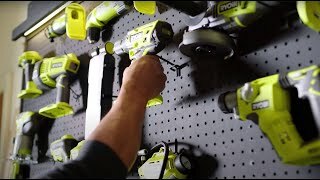 All of this is backed by the RYOBI 3 year limited warranty. Cutting Height 1.25 - 2.75 in.